WELCOME TO THE CONVENTION ! This year sees London putting on its sixth official Convention since 1938, and, although it will not be so star-studded with visitors as last year's International Convention, it looks like being the biggest and most interesting the Capital has had the pleasure of organising. Fans and readers of science fiction who have attended previous Conventions need no introduction into the delights and high lights of a two-day meeting crammed with interesting discussions and personalities connected with their favourite literature, but, for the people who have never attended one, let me make your mind up now for you. It is a memorable occasion and one that gives food for thought and conversation for many months afterwards. Something will be happening all the time, from the moment the Convention opens at 11.00 a.m. on Saturday, May 31st. up until the closing stages on the Sunday evening. The setting of the ballroom in the Royal Hotel is ideal, and there are plenty of places to eat and drink nearby, or on the premises. I look forward very much to meeting old friends and new - all two hundred of them! - at the Whitsun Convention. THE TREASURER AND OTHER CONVENTION OFFICIALS WOULD BE GRATEFUL IF YOU WOULD REMIT YOUR ADMISSION FEE BY POST BEFORE THE CONVENTION, TO ELIMINATE CLERICAL WORK DURING THE PROCEEDINGS. *Note. The programme herein is provisional, and although every effort will be made to adhere to it, it is liable to be varied to suit circumstances. REMEMBER !!!! 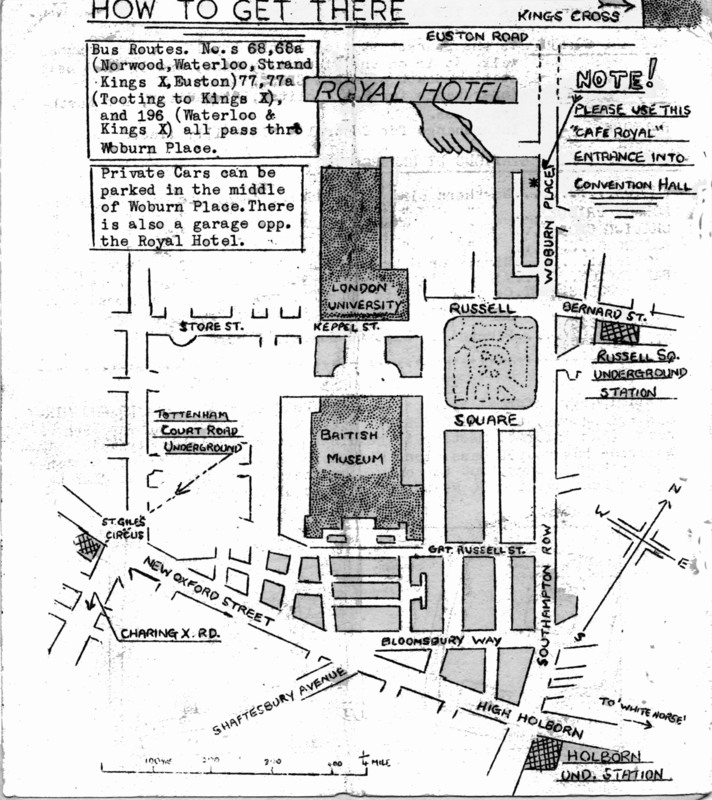 It's the ROYAL HOTEL, BLOOMSBURY, for the weekend Main Sessions, but ALL COMMUNICATIONS should go to the WHITE HORSE, where the Preliminary Sessions only will be held. AUCTIONS Your donations of fantasy books, magazines and art are requested for the Auctions on Saturday and Sunday, the proceeds of which will help next year's Convention. Any items will be auctioned on a percentage basis if the owner wishes ... please contact a Committee member beforehand. This is your chance to help others, and to pick up that item you've been wanting yourself ! RECORDINGS As most Convention guests will know, Arthur C.Clarke, noted s-f author and astronautics expert is at present visiting the US, following the 'Book-of-the-Month-Club' choice of his recent 'Exploration of Space'. He echoes our regrets that he cannot be present at the London Convention this year, but has recorded an address which will be played at the Con. By arrangement with Messrs. Hutchinson, the publishers, a short recording of a scene from Dennis Wheatley's new s-f novel, "Star of Ill Omen" (Hutchinson 12/6d) will be played during the Convention, with Mr. Wheatley in the leading role. We also hope to present a recording, made at the San Diego S-F Convention a few weeks ago, when many famous s-f personalities were present. FILM PROGRAMME The Committee are attempting the ambitious programme of three full length fantasy films, as well as several shorts of scientific and science-fictional interest. EXHIBITORS Anyone wishing to exhibit fantasy books, magazines, or art-work etc., in the Convention Hall, should contact the Sec. 'Teen-agers' will be admitted at half-price. 11.00 a.m. Informal Sessions, with general introductions. 2.00 p.m. opening speeches and public introductions. Representatives from Liverpool, Manchester, Bradford, Leeds, and other centres of s-f activity are invited to speak. Public Question: Should London monopolise Conventions ? 5.00 p.m. Recorded speech by Arthur C.Clarke. 8.00 p.m. Film Show: It is hoped to show "The Man Who Could Work Miracles' and 'Paris Qui Dort'. 10.30 p.m. Conclusion of Saturday sessions. NOTE. It has been suggested that those centres wishing to hold the national s-f Convention in ' 53 should put forward their case during the afternoon session, and at the conclusion of the Convention on Sunday, a vote is taken. 11.00 a.m. Informal session. Repeat of Arthur Clarke's recorded speech. 11.30 a.m. Magazine editors 'talk shop' and answer questions. 2.00 p.m. Author's Circle; a group of s-f authors have been invited to speak on "Why I write science-fiction", and associated matters. Comments on s-f are invited from the audience. 3.30 p.m. Announcement: The International Fantasy Award. 8.00 p.m. Film Show; It is hoped to show 'Metropolis' and a number of short films of science-fictional interest. 10.30 p.m. Official close. Final words and farewells. NOTE. Any plans for parties, etc., on Monday, June 2nd, or extra to the Convention sessions during the weekend, will be announced. If time permits, we hope to include a playlet by the S-F.Soap Opera Company during the weekend proceedings. Details of Britain's oldest regular meeting, the informal LONDON CIRCLE group, will be found opposite. LIVERPOOL SCIENCE FICTION SOCIETY have a separate club room to which members have a key. Details from the Vice-Chairman, John.D. Roles, 28, Pine Grove, L'pool 22. MANCHESTER fans can meet others in the NOR'WEST S-F CLUB. Details from Dave Cohen, 32, Larch St, Hightown, Manchester 8. An s-f club is now active in BRADFORD. Details can be obtained from Derek Pickles, 22, Marshfield Place, Bradford, Yorks. A postal club for TEEN AGE FANS has been started by Ken Potter, 5, Furness Street, Marsh, Lancaster. The MEDWAY SCIENCE-FICTION FAN CLUB has recently opened in Gillingham, Kent. Fans in the vicinity should contact. Anthony Thorne, 21, Granville Road, Gillingham, Kent. Newest club is the NEW LANDS S-F FAN CLUB, in Glasgow. Scottish fans get in touch with Matt. A. Elder, 37, Moray Place, Glasgow, S.I. 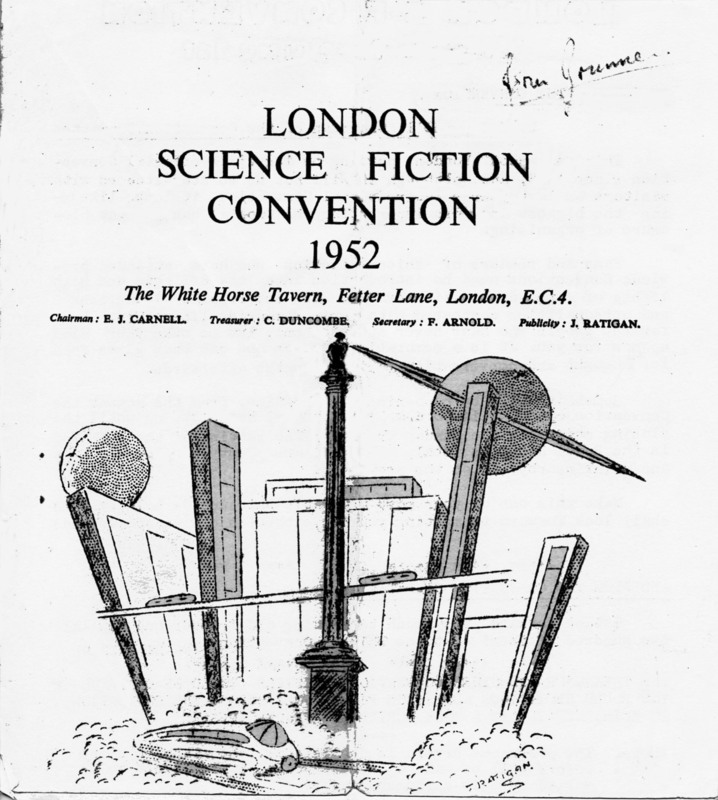 THE CONVENTION COMMITTEE WISHES TO RECORD ITS APPRECIATION OF THE PUBLICITY GIVEN TO THE CONVENTION BY 'NOVA PUBLICATIONS' AND ITS MAGAZINES 'NEW WORLDS' & 'SCIENCE FANTASY', AND TO MESSRS HAMILTON AND THEIR MAGAZINE 'AUTHENTIC SCIENCE FICTION MONTHLY. THANK YOU, PUBLISHERS AND EDITORS! RUSSELL SQUARE is the nearest station to the Royal Hotel (3 minutes walk. It is on the Piccadilly Line, and is the next station South of KINGS CROSS. KINGS CROSS interchange for Metropolitan, Piccadilly, and Northern lines. HOLBORN Interchange for Central & Piccadilly lines. EUSTON...........Northern Line to KINGS X., change to Piccadilly Line. LONDON BRIDGE " " " " " " " " " " " " " " " " " " " " " " " " " " " " " " " "
CHARING CROSS " " " " " " " " LEICESTER SQ. " " " " " " " " " " " "
WATERLOO......... " " " " " " " " " " " " " " " " " " " " " " " " " " " " " " " "
PADDINGTON......Metropolitan Line to KINGS CROSS, change to Pic. Line. LIVERPOOL STREET..Central Line to HOLBORN, then change to Piccadilly, or Metropolitan Line to Kings Cross, change.